It’s springtime and a great time to start planning your company’s annual picnic. Planning a company picnic can seem to be an overwhelming task, but as the ideas begin to flow you envision a day filled with fantastic food and fun. In fact, we will help get those creative juices flowing with a few ideas and insight to help make your company picnic a successful delight. One of the first things you need to consider is just where to have this picnic. You can go all out nature and have it at a national park or nature preserve, but this leaves you little room for entertainment options. After all, watching a squirrel hide nuts will prove to be only somewhat entertaining. However, these locations often offer picnic tables, shelters and there is sure to be hiking trails nearby. We feel a good location is an amusement park. Employees and their families are sure to love the rides, and this means less of a burden on you as you don’t have to worry about keeping everybody entertained. Even if you decide on an amusement park as your venue, you still want some other form of entertainment. Perhaps you know an employee who plays in a band. Live music is always entertaining. Make sure you provide at least a few games for people to play. For example, bring along horseshoe equipment, a bocce ball set and maybe even a volleyball set. 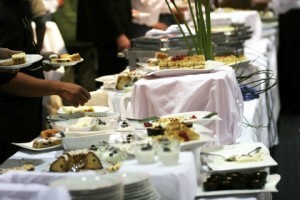 When it comes to food, we suggest you hire a caterer. Sure, you can just buy buckets of chicken and side dishes from your local market, but this will impress nobody. You want something that will knock their socks off. This way, if the entertainment fails to entertain and the games are approached with trepidation, at least the food will be remembered as epic. Rely on our fabulous catering services, your company picnic might be a failure without us.